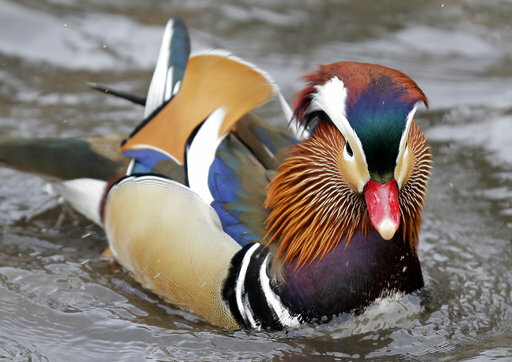 (AP) - It took just days for the brightly colored Mandarin duck that appeared suddenly in a Central Park pond to turn both New Yorkers and visitors into a new gaggle: the quackarazzi. A horde of photographers has been gathering daily in the park off Fifth Avenue for well over a month, hoping to catch a glimpse of the exotic bird with pink, purple, orange and emerald green plumage and markings that admirer Joe Amato compares to "a living box of crayons." "So many people are drawn to this bird because its vibrant, vivid colors are associated with sunsets and rainbows," says Amato, who comes almost daily from his Queens home with his expensive camera equipment in tow. This week, New York's latest rising star didn't disappoint - with the feathery showboat preening its wings in the shadow of the historic Plaza Hotel as people on shore jostled for a better look. Leesa Beckmann commuted two and a half hours from her home in Vernon Township, New Jersey, to see the duck that her 90-year-old mother has been talking about since its arrival. "I've got to see this magnificent duck," Beckmann said to her mother. She plans to shoot and frame photos for her mother to hang on the wall. Ornithologist Paul Sweet, however, who heads a vast collection of bird specimens at the New York-based American Museum of Natural History, isn't as throttled as others are about the duck. Sweet says there's nothing special about a Mandarin duck in Central Park. Not only is there another one (albeit captive) a short walk away at the Central Park Zoo, but such ducks are often imported from Asia for use on private property. From time to time, they escape into the wild. "This bird is clearly not a vagrant," said Sweet, adding that there are no records of actual wild Mandarin ducks in North America. If that actually happened in New York, of all places, "birders would be very excited." For now, he says, they're not. "A lot of non-birders tend to see gaudy birds as more beautiful," Sweet said. "But to me it's no more beautiful than, say, a sparrow." In this case, expertise is not the point: Beauty is in the eyes of the New York beholders humans for whom the carefree creature that has made Central Park its home offers some kind of balm in a troubled, chaotic world.